It was only in the summer of 2010 that I discovered the Ottawa Bicycle Club. I was looking to build my endurance, in order to be able to finish skating races stronger. In my first season of road cycling it was all about the basics, like how to corner in a pack, how to get on a wheel, how to hold your line. To sum it up I would say that it was about learning how to ride to prevent injuring anyone else. About half way through the summer my club drove to Bromont where I got a chance to ride the track for the first time. Once again, it was all about the basics. The following summer, there was a month that every weekend I was at a track. The first two weekends on bike handling and group skills. 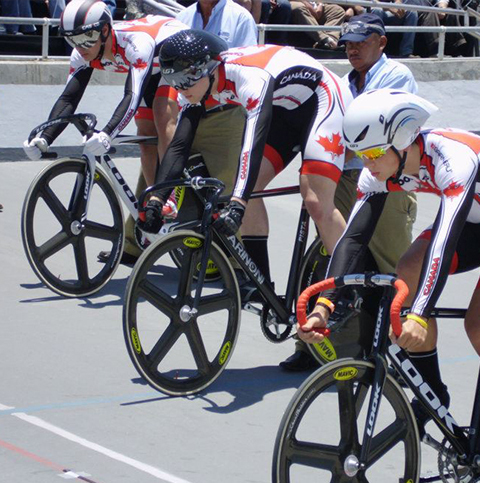 The third weekend was the track provincials. I remember my coach going up to the other riders before the match sprint, and telling them to take the front. This was because he was worried that if I took the front and another rider would try to pass me by going over top of me on the last lap, that I would not be able to stay in the sprinters lane at that speed, resulting in a collision. The following week was track nationals. My coach told me that I would not be able to rent one of the bikes at the Bromont track. So I went to my local bike shop, Cycle Power, and asked them if they could lend me a bike. The owner, Ken Power was more than glad to build me a bike using a frame he was planning on riding himself as a commuter bike. Although the frame was a little small, I was happy with whatever I could get. That small green MASI Cotello proved to be very faithful, as I have now ridden it to three silver medals. When it came down to tactics, I don’t know who I annoyed the most, the coaches or my fellow athletes with my constant questions about strategies and reasoning behind each one. In most races what ended up happening was that I raced with my legs and not my head. I was always waiting for an attack, so that I could try to respond in some way. During the 2011-12 speed skating season, I made sure to make time to ride my bike on a trainer or rollers twice a week. Unfortunately, I only had time to attend one of the winter track cycling camps. My goal for the 2011-12 skating season was to represent my country at the 2012 Junior World Championships. Sadly, due to a little knee problem and lack of ice time in Ottawa, I was not competitive enough in the longer distances to qualify. 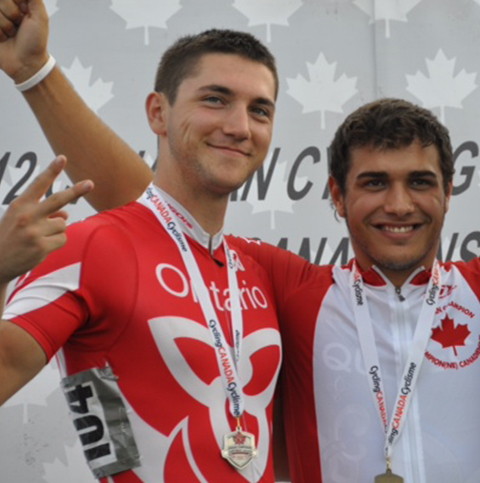 This served as motivation going into the 2012 cycling season, where I had set the same goal for the 2012 Junior Pan-Am championships. This time around I achieved my goal. Going into the competition, I did not know what to expect of myself due to that fact that I had just came off my speed skating season. However, once racing had begun, I saw I was posting similar times to the other riders so my goal changed from just qualifying for the competition to bringing home a medal. I saw that I had a shot in the match sprint when I qualified in fourth with a time that was only 0.03 off the first place qualifying time. Unfortunately the other riders knew when and how hard to attack so I was once again waiting to respond in some way. The best part of this competition was that I visibly improved with every round. My racing changed from a feat of strength to being a game of cat and mouse. Unfortunately, I did not have the knowledge to play the game at his level. 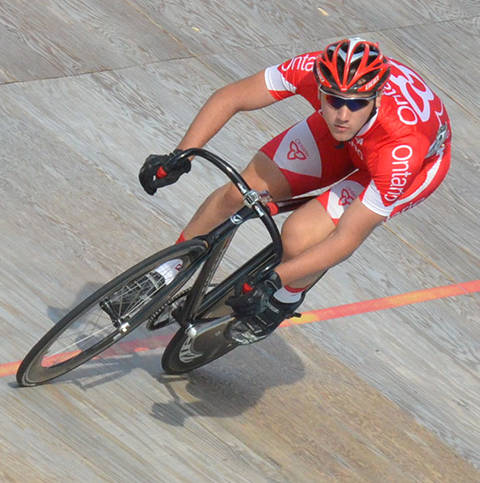 Vincent De Haître is a former multiple time National Champion and national record holder. 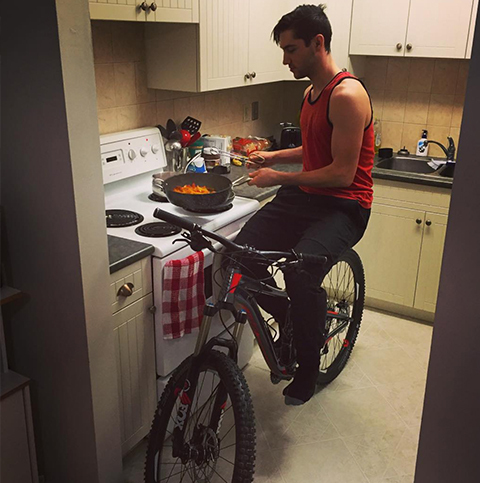 He has been in and out of cycling for a few years now, and plans on making a run as a full-time cyclist for the 2020 Olympics. I enjoy this sport immensely and would like to continue to develop my skills to the highest level possible. I have been following a cycling training system set up by my coach. This includes structured training workouts, weight training and race support. During the summer, we have access to coaching support three to five times per week during training races, ITT’s, training rides as well as direct access to club coaches as we require. We have coaching and/or Team Manager support at many major races. I am being trained and monitored through a structured training system designed by our coach. Last year I trained 600 hours and this year I am doing 600-650 hours but that number is subject to be increased throughout this coming season. Training includes strength training, interval workouts, training zone evaluations, video analysis and monitoring of training and racing by the club coach. Gold in team sprint and 3 silver; match sprint, kilo,and keirin.